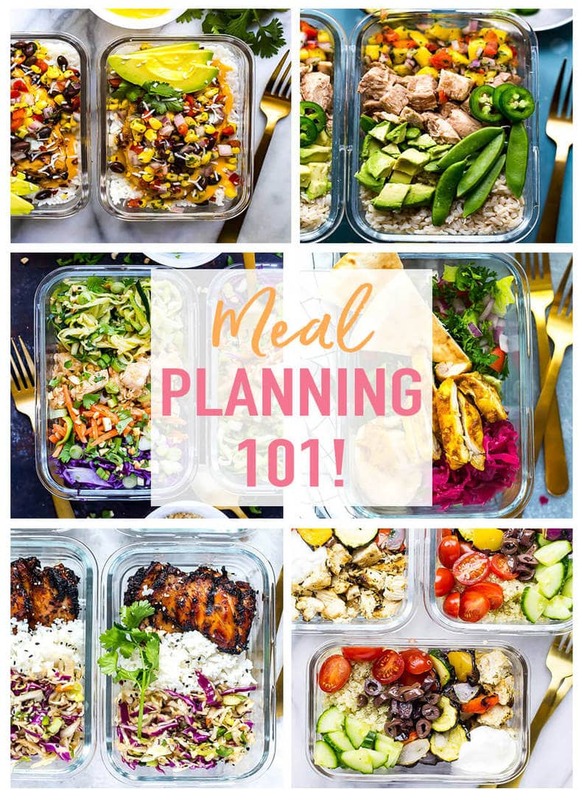 If you're looking to get more organized with your weekly meal prep but don't know where to start, all you need is a plan! I'll show you how to plan your meals for the week so that you can stay on track with your health and fitness goals! If meal prep is on your list of New Years Resolutions but you're having trouble sticking to a meal plan, or even just the THOUGHT of meal planning terrifies and overwhelms you, then this post is for you! I've been meal planning in some way or form for YEARS now. With a crazy busy schedule that isn't always the same from week to week, I really do have to plan ahead if I want to save money on food and eat healthy. Honestly, healthy eating can feel like a full time job if you don't know how to stay organized or determine what your time constraints are. If you're looking to get serious about meal prepping and make more delicious food, you HAVE to sign up for my free 5-day challenge below! Bento box containers are perfect for packing snacks and lunches together! Keep your freezer full of high-quality grass-fed beef and poultry from Butcher Box – and for a limited time get two free ribeyes and bacon! Hello Fresh also has some AWESOME recipes if you need groceries delivered, and they will give you $30 off your first purchase too! I've got a handy little planner you can download for free (along with a whole meal prep resource library too!) – you can write down your meals for the week and also mark down the nights you're out for dinner so that you can anticipate what recipes you'll want to make and when you're going to eat them. GET A MEAL PLANNER & SHOPPING LIST WHEN YOU SIGN UP FOR MY MEAL PREP CHALLENGE! Writing out your shopping list on the same page also helps because you know what ingredients you need for which recipes and can see it all at a glance. 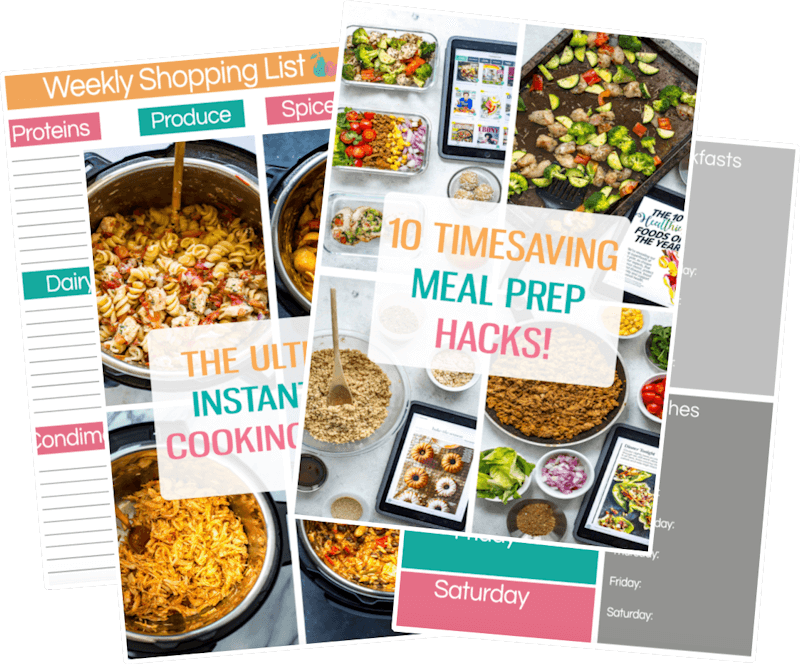 Keep your meal planner pinned up on the fridge or somewhere in the kitchen so you can see what you're going to make each night – EASY! Breakfast is the one meal of the day that I could care less about, and if you're anything like me you are too busy trying to get yourself to work to worry about eating. I actually don't even have an appetite first thing – my body takes about 1-2 hours before it gets hungry so I end up eating after I've started my work day. 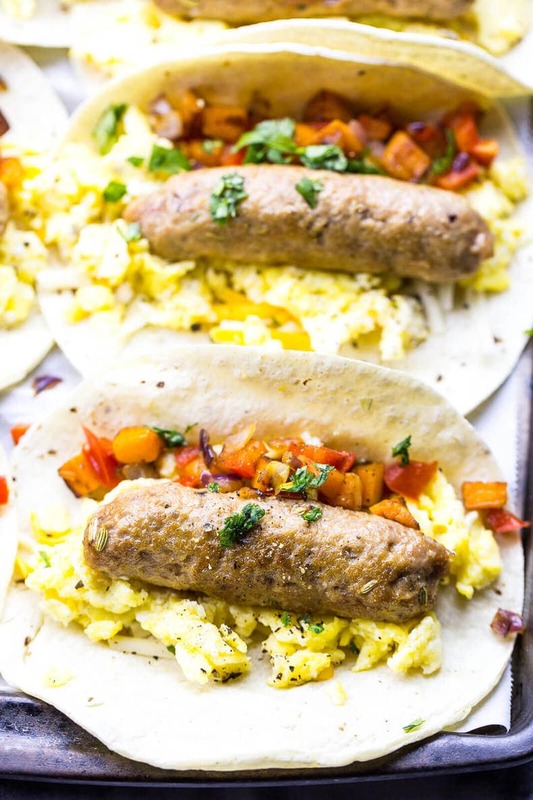 My go-to meal prep breakfast recipe? EGGS! I make a big frittata at the beginning of the week (sometimes I'll do egg whites to pack in the protein) or some mini egg cups or a breakfast quesadilla. They're super easy to prepare in bulk at the beginning of the week, and they taste just as good cold as they do warmed up so you can take them on the go if you can't eat first thing like me. Plus you are saving yourself from a ton of sugar that is usually in other breakfast items like cereal, pancakes, oatmeal, granola, yogurt, etc. You're honestly better off pairing your eggs with some fruit like a banana or an apple. Get your fibre and your protein all in one! 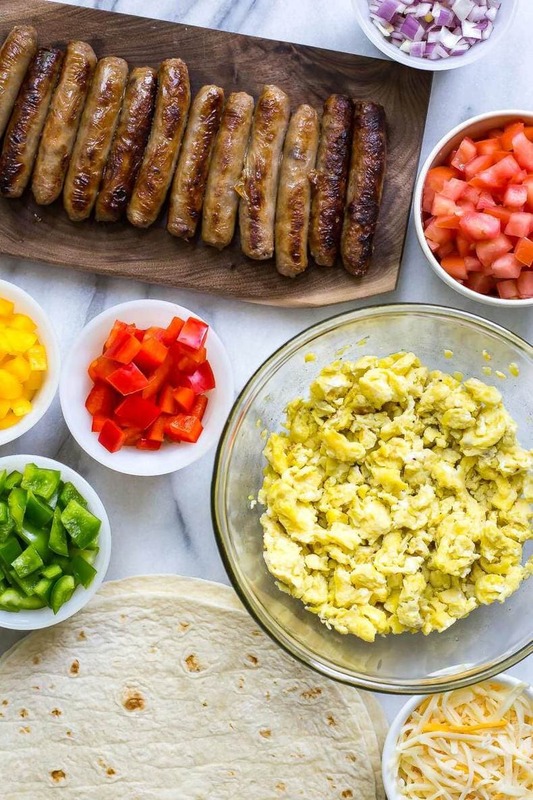 And the best part is that you can prep your breakfasts in less than 30 minutes all at once while doing other meal prep for the week in the kitchen! This is another area of my life that I try to keep as simple as possible, but I know it's easier said than done. I don't usually have time to meal prep any snacks so I end up trying to keep some healthy favourites on hand at home at all times. 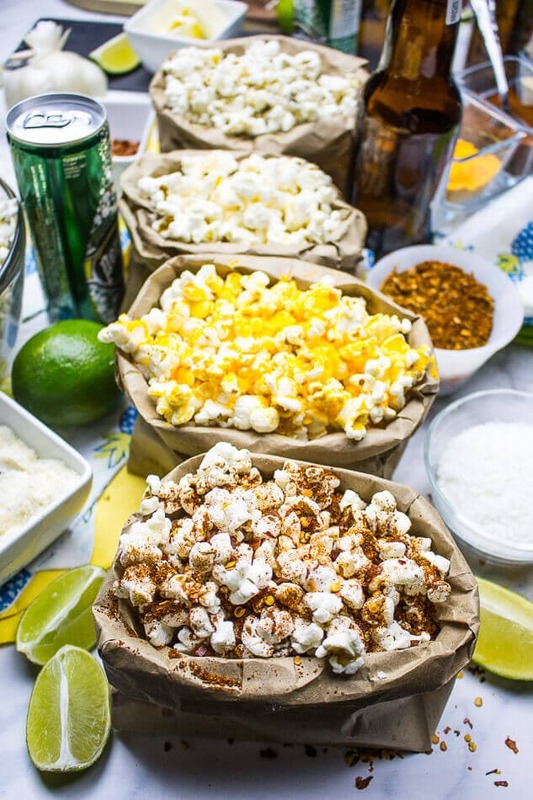 Snacks like frozen edamame, protein bars, energy bites, fruit, cut up veggies and hummus, popcorn, nuts and smoothies are all things I keep on hand. 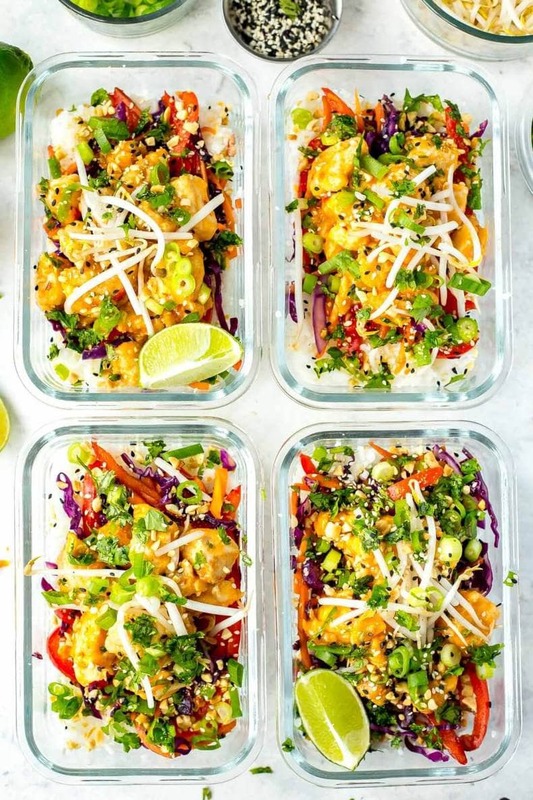 I love the idea of prepping some freezer smoothie packs/jars like my other fave meal prep blogger Denise at Sweet Peas and Saffron does so you can easily throw together a snack when you're hungry. This is one of my best tricks ever! As a single person, I find it super difficult to make individual portion sizes for myself so I usually end up cutting a recipe in half to make two servings. I eat one for dinner, and I eat the leftovers for lunch the next day! 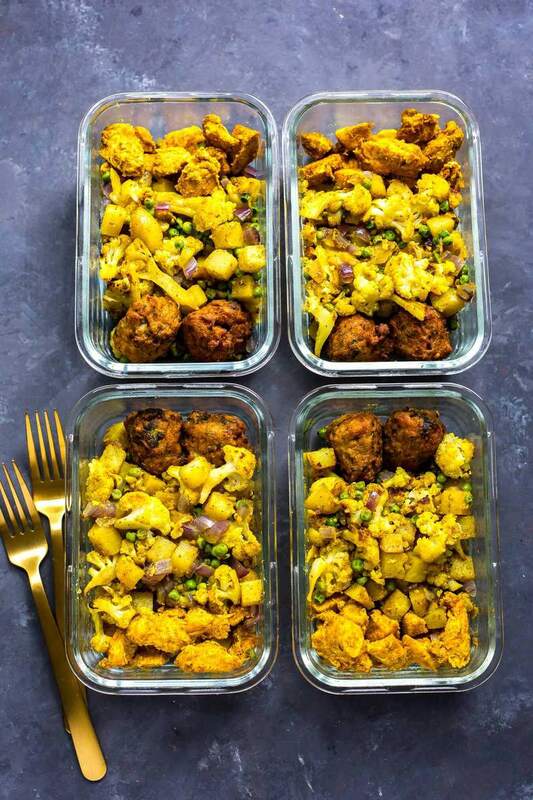 If you're a family of four, you can double the recipe and everyone will have leftovers for lunches as well – really, this is my favourite way of meal prepping because you're most likely going to be cooking dinner anyway, you might as well make two or three other meals out of it! When I have a busy week and I'm not sure of what I'm going to have for dinner, I try to prep one set of lunches for the work week so that I know I don't have to run out and buy something on-the-go. I find when I'm in a rush and don't know what to have for lunch, I'll put off the decision long enough until I'm starving and by that point I'll eat anything. If you're looking to get serious about meal prepping, you HAVE to sign up for my free 5-day challenge below! Having at least 3 or 4 meal prep bowls for the week ready ahead of time really helps me stay on track, and most of the meal prep bowl recipes on my site can be made in an hour or less! This is an area of meal planning I really struggle with. I always want to try so many recipes that I neglect to let some of them overlap. 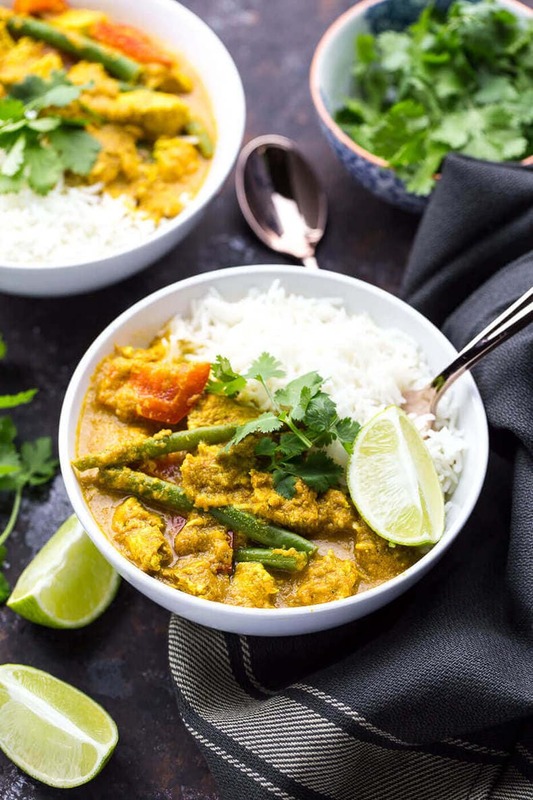 For instance, you want to look for recipes that use many of the same kinds of veggies and protein so you're not going out and buying 30 different items for 5 recipes. Try to find some overlap. 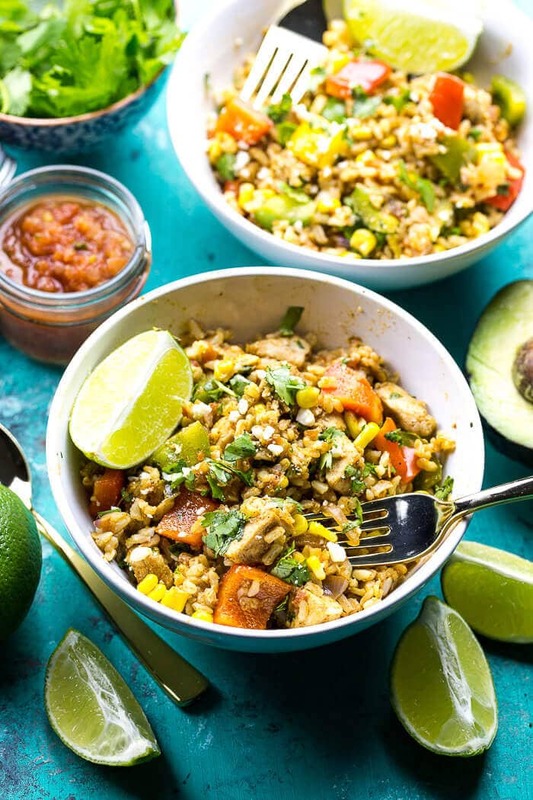 Make Chicken Tikka Masala one night, then Fiesta Chicken Rice Bowls the next – both use chicken breasts, jarred crushed tomatoes, bell peppers, rice and cilantro. Try to do this for as many recipes as possible during the week – it's still more than possible to have a ton of variety with meal prep! Last but not least, make your meal plans based around what you've got going on during the week. Got soccer or yoga after work? Maybe make a slow cooker or Instant Pot recipe that will be ready for you when you get home. Or plan on having some leftover chicken and veggies kicking around, or prep another meal prep bowl. You'll also want to factor in the fact that some nights you just won't feel like cooking, like the weekends, and that's ok! I almost never cook on Saturday nights so I make sure to leave that night blank so I don't pick up extra ingredients that will go to waste. You'll have to find a groove with this but it gets easier with practice! 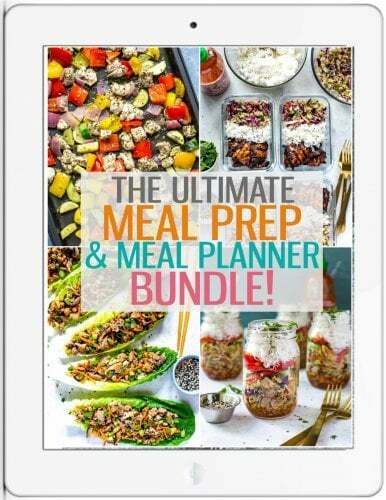 You must be my meal-planning soul sister! I sat down and thought about my perfect meal plan, and it included eating the same breakfast everyday that week and making enough dinner so that I had the next day’s lunch ready to go! Since we apparently want the same things out of life (or, you know, maybe just our single-lady meal plan), I am really excited to try your other tips.